Pope Francis today issued a 256-page proclamation exhorting Catholic clergy to be more welcoming to those involved in what the church considers nontraditional relationships, including people who have been divorced and remarried, gay couples and unmarried men and women living together in romantic relationships. While the document – titled “Amoris Laetitia” or “The Joy of Love” – is largely aspirational (it doesn’t change any church rules), its words and tone may be more in line with what many American Catholics already think, according to our surveys. Indeed, a 2015 Pew Research Center survey of Catholic views on family life found that U.S. Catholics want the church to be welcoming to people living in a variety of nontraditional arrangements. For example, six-in-ten Catholics say they think the church should allow those who are divorced and have remarried without obtaining an annulment to receive Communion. And a similar share of Catholics think cohabiting couples should be permitted to receive the Eucharist. In addition, nearly half of American Catholics say the church should recognize the marriages of gay and lesbian couples. The data also show that many Catholics believe that in the near future the church will make key changes in its handling of family matters. Indeed, about six-in-ten U.S. Catholics say they think the church will reverse its ban on birth control in the coming decades, while more than half say they think the church will soon allow cohabiting Catholics and those who have remarried without an annulment to receive Communion. Fewer Catholics think the church will recognize the marriages of gay and lesbian couples in the near future. Catholics’ views on these and similar questions may reflect the fact that American Catholics themselves are experiencing family life in all its modern complexity. 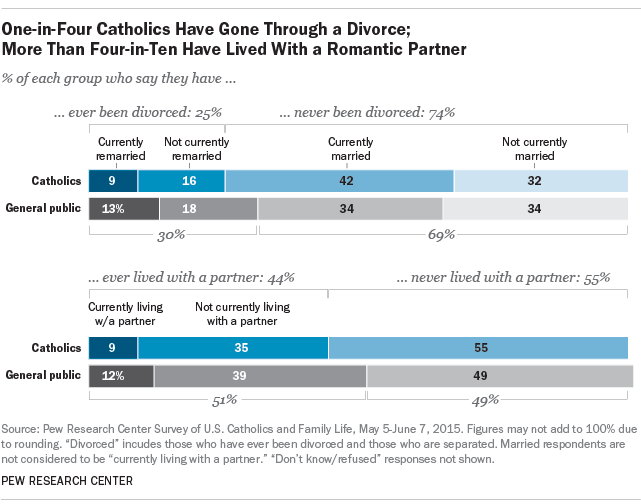 One-quarter of Catholics say they have been divorced, including one-in-ten who are now remarried. And fully 44% of U.S. Catholics say they have lived together with a romantic partner outside of marriage at some point in their lives, including 9% who are currently cohabiting. The survey shows that Catholics who say they attend Mass regularly (i.e., at least once a week) express different views and have had different experiences as compared with Catholics who attend Mass less often. For instance, regular Mass-attending Catholics are not as likely as less frequent Mass-goers to have been divorced or to have lived together with a romantic partner outside of marriage. 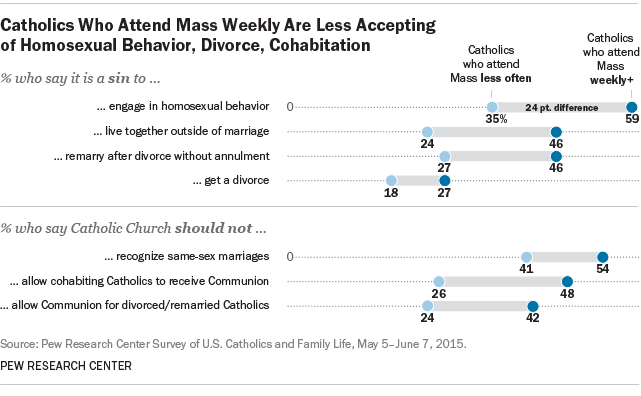 In addition, mass-going Catholics are more likely than less observant Catholics to affirm the church’s position that homosexual behavior and cohabitation are sinful, and they are less likely to say the church should allow Communion for divorced and remarried or cohabiting Catholics. Still, even among Catholics who attend Mass regularly, substantial shares voice a desire for change in the church’s handling of these kinds of issues. The Joy of Love represents the culmination of the work of two synods convened in the past two years by Francis to examine how the church can better respond to modern family life. But while it is not yet known what, if any, practical impact it will have in years to come, if Pope Francis or his successor decides to turn The Joy of Love’s exhortations into hard and fast rules, he could find a substantial amount of support among U.S. Catholics.